Just like any timeless piece, Jane Austen’s work will enchant readers for years to come. There is something about her writing, the way she encompasses so many different aspects of life within just one character that can grasp the attention of readers in any discipline. Regardless of how many times her work has been adapted, molded, and replayed, it seems as if she will always have an audience. Just looking at Persuasion specifically, it seems as if the more it is adapted, the more interested and involved people become. It is because of the way she creates her characters, the realism behind the plot, her humor and wit, and the way it appeals to so many who too are looking for their Wentworth, that Janeites continue to be enthralled by her work, and the work of many adapters as well. Austen, Jane. Persuasion. A Norton Critical Edition, edited by Patricia Meyer Spacks, 2nd ed. W. W. Norton, 2013, pp. 1-178. Regardless of how many times Persuasion has been adapted, true Janeites are always going to want more. There are so many scholars who have grappled with the question of why that is, just as I am now, but the truth is that there are many reasons why. There is no author today or from any other era that has created novels quite like Austen. There is no one who has latched onto the perfect balance of absurd wit and realistic circumstances like Austen has. Her novels are just Fiction, but it is the type of Fiction that can be so close to any one of our realities that we never want it to end. It can be that type of Fiction which has all of the elements that one wishes for or has in one’s life. From romantically torn ex-lovers like Wentworth, to money, or family issues, Austen’s work is consistently relatable. That is what I think gives us all this personal relationship with Austen and her work. As Janeites, we become so invested in every word that she writes. We feel a personal connection. Not only are we reading what Anne is doing, we are right beside her screaming, “tell him you love him, stupid! Do not let him walk away again!” Many who watched the scene in the 1995 BBC adaptation where Anne is reading the letter from Captain Wentworth were melting more and more with every passing word that she read, wishing that we found someone who cared enough to pour his/her all into something like that. If you have not seen that scene, I highly recommend that you do, and you can conveniently find it below. Each and every one of her novels become our own. We all know someone absurdly self-obsessed and money hungry like Sir Walter. We all know that one girl like Anne who has so much potential and is so kind hearted, but gets walked on and treated horribly when they deserve the world. We all know someone like Mary who complains about everything and whines to the extent of being annoying, and we all know of a Captain Wentworth, whether it be in real life or in our dreams. Even though it is just Fiction, Persuasion can give so many people hope. Whether it be someone who has lost their bloom and are hopeless to ever find love, or someone who has lost their perfect person, Persuasion can relate to them. Janeites want to see Anne and Wentworth's love story over and over again, and each time it gets better. It is for those who strugge with balancing what they want and their familial or societal expectations. It is a timeless work that will always be relatable. That is why so many people adapt and reproduce Persuasion, because there is so much about it that people can relate to and that people love. That is why so many people flock to adaptations: they never wanted to original to end, so they must fulfil that need for more in some way. There is so much that each of us wanted more of from the original text that it did not have did not have. What one may have felt like they were missing can be fulfilled from an adaptation. It is a way to build on a story already so amazing. The adaptations add to the story and often I , and many others, are left feeling like I have a little bit more. Persuasion. Dir. Roger Michell. BBC, 1995. Film. Mary are just two of many characters that the director, Roger Michell, put emphasis on but in the most accurate way to the novel. 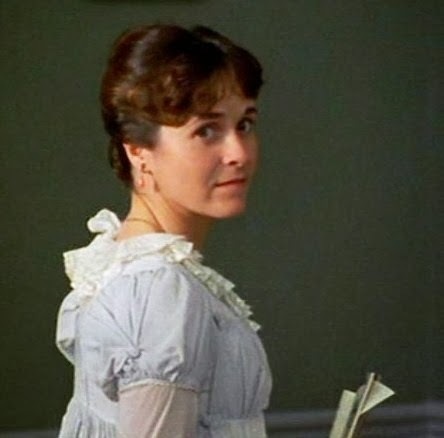 In Austen’s novel, we are able to understand that Mary whines, is a hypochondriac, and over dramatic, but seeing her character portrayed that way in a film gives the audience a completely different experience. We are then able to hear just how ridiculous she sounds, and see just how obvious it is that she is faking her ‘sickness’ for attention and how she can go from stuffing her face with food shown in the first film still to the left, to dying on the couch as shown in the second film still to the right. Persuasion. Dir. Adrian Shergold. BBC, 2007. Film. Experiencing that is aesthetically pleasing to the reader. Similarly, Sir Walter’s self-obsession shines through clearly in the 2007 adaptation. His mistreatment of Anne is so much more apparent to the audience. Seeing how he treats her like a servant excite the emotion that the audience should have felt stronger when reading the original work. Austen explains his self-obsession in Persuasion, however, it is only magnified to the point of humor. This is shown in the film still to the left when Admiral Croft and his wife enter Kellynch for the first time to move in and are surprised by all the looking glasses. Adaptations like this allow the audience to get one more piece to the puzzle. The audience is experiencing the same characters that Austen created, but we are seeing more of them. We are able to pick up a piece here and there creating a more developed picture. 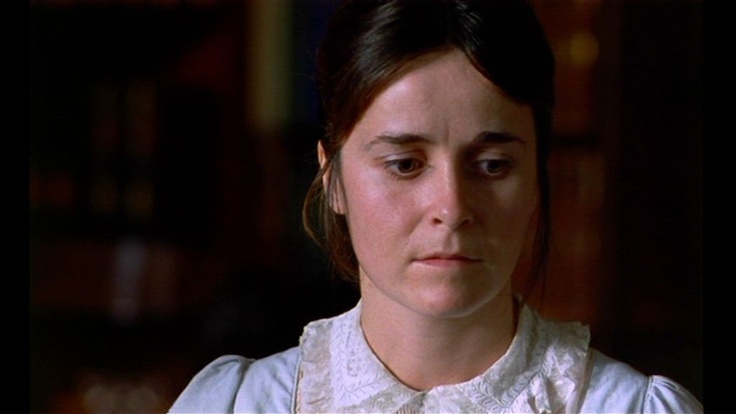 Not only do readers understand that Anne is being abused by her family, but being the 1995 adaptation, the reader is able to see that feel stronger emotions on the subject. That understanding can only come through exploring other sources of Persuasion. Each adaptation gives the audience something they did not have before, or emphasizes key aspects to create a better understanding of the plot as a whole. When comparing the 1995 adaptation to the 2007, the portrayal of Anne incites a much different impression. Her transformation into her new bloom of life is much more apparent in the 1995 adaptation because of casting, clothing, and style choices, and thus is able to give the audience a much more obvious depiction of how she went from hopeless to hopeful. You can see in the first figure that her character is much more homely or bland looking before she became hopeful about Captain Wentworth again. In the following figure, it shows Anne after becoming hopeful and the audience can see more light in her face and outfits, and even a smile. That transformation is of course present in the novel, however, the reader does not get to see how Wentworth physically effected Anne. Experiencing that through the film truly shows how her second chance saved her, and the audience can see for themselves how she gradually gains hope for her life through reconnecting with her lost love. This use of metaphor in the film allows the audience to pick up on those hints that the novel originally gave. The Lake House. Dir. Alejandro Agresti. 2006. Film. The different ways Austen’s characters are portrayed becomes increasingly interesting to study. The differences between how the ‘95 and the ‘07 adaptation portrays Anne is significant. Finding out what those reason are and thinking about how it effects the audience's interaction with the adaptation is fascinating, and that is one of the reasons why so many Janeites search for adaptations of Persuasion. Each one gives so much that another may be lacking. One adapted novel, like Cecilia Gray’s young adult novel Always You, may focus on the romance aspect and rely heavily on flashbacks to fill the reader in on the relationship that Anne and Wentworth previously had, while another adapted film like The Lake House focuses on the theme of waiting until the time is right. Regardless, by immersing oneself in each one, a broader understand of Austen's story as a whole is developed. Even if someone were to find an adaptation that they absolutely hated, they would still have a better understand of the original novel because they would have a basis to go off of what it is not and should not be. Janeites do not stop at the original text. It does not stop there. 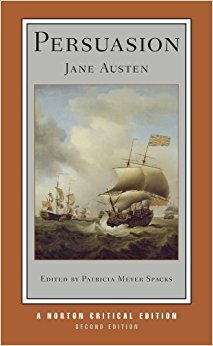 Reading Persuasion would be the start to a long, and some may even say obsessive, journey of Austen’s work. Gray, Cecilia. Always You. Gray Life, LLC, 2015. Exploring adaptations of Persuasion is like a box of chocolates; you never know what you are going to get. It could be fantastic and pull on every heart string you have, or it could be horrible. Luckily, I personally have not found an adaption of Persuasion that I disliked, and I think that is because I find something good out of each one. I focus on the main overarching concept that they brought to the novel that other adaptations did not, and I use that to build on my original interpretation. In Always You, I think Gray did a great job at incorporating the flashbacks, although I did find it was quite juvenilely written even for a Young Adult Novel. Nonetheless, I was thoroughly impressed with how she was able to give the reader an understanding of Anne and Wentworth’s relationship before they broke up. The reader is able to see how they fell in love, and that is something that was completely left out of the original text. Similarly, The Lake House put emphasis on the emotion of the novel, although there are several gaps that can be noticed within the plot. It can be concluded that both Anne and Wentworth are quietly tortured because they are so close to each other and getting each other back, but feeling so far away at the same time, but that raw emotion that I desperately wanted from the novel was not there. I did, however, feel that emotion in The Lake House. No adaptation will ever be as good as the original, and it is not supposed to be. Adaptations as supplements are incredibly useful sources that can help people, like Janeites, continue their journey with novels and stories that are their favorites. In the novel, I was rooting for Anne and Wentworth, but I was nowhere to being on the edge of my chair with tears in my eyes like I was when I watched as Kate fell to her knees sobbing because she thought she lost Alex forever. It gave me that emotional turmoil aspect that I was wanting from the original. It was obvious in Austen’s text that both Anne and Wentworth were completely destroyed by their break up, but we do not see that. We only understand that from what we read between the lines. The Lake House gave me that. I could see Kate’s heart literally breaking as she waited for Alex to open the mailbox. It reminded me just how close they were to losing each other in the original text, just how heartbreaking those moments leading up to their reconnection were. WendyCR72. “The Lake House: ‘You Waited…’” YouTube. 21 Oct. 2010. https://www.youtube.com/watch?v=5djX9LEb0yI. It is adaptations like those above that continue to make Janeites want to explore others. Being able to see how other mediums can change and emphasize the plot brings a better understanding of the novel. All of these aspects that adaptations bring into light are there for a reason, and people like them or else they would not be so popular. No true Janeite wanted Persuasion to end, and adaptations are a way to stop the story from ever ending. Austen gave us a novel that is universal: universally relatable, and universally adaptable. After reading Persuasion, a part of it lives in us. It is a timeless masterpiece that continues to live and flourish in today's world because of different adaptations and reproductions of it. Austen’s novels will continue to steal the hearts of young women and entice people for ages to come. So, regardless of how many times it has been done, I say go for it. It is a story that will never get old. Each adaptation gives us something to look forward to, something to add to Anne’s story. No one could ever have too much Austen anyway. Austen, Jane. Persuasion. A Norton Critical Edition, edited by Patricia Meyer Spacks, 2nd ed., W. W. Norton, 2013, pp. 1-178. Ciaran Hins Fan Channel. “Ciaran Hinds as Captain Wentworth in ‘Persuasion’ 1995.” YouTube. 15 Jan. 2017. https://www.youtube.com/watch?v=NYSzac4mccA.